Swiss chard recipes are the perfect addition to a healthy diet. This is a fantastic recipe for swiss chard that combines this healthy vegetable with quinoa, a very healthy and tasty grain, a few spices and chick peas. Quinoa recipes are terrifically healthy and a great addition to any healthy meal plan. The canned chick peas add more protein to the dish. They are both convenient and delicious. Of course if you prefer you can use dried chick peas. You will need to soak and cook them before using them in this recipe. It's a bit of work, but if you are a purist, it's worth it. In a medium saucepan bring the broth to a boil over medium high heat. Stir in the quinoa, then reduce the heat to low and cook for 15-20 minutes until the quinoa is tender. Remove it from the heat and fluff the quinoa with a fork. Set it aside. In a large nonstick skillet, heat the oil over medium-high heat for 1-2 minutes or until hot. Add the onion, jalepeño, paprika and chipotle. Cook and stir for 3-5 minutes or until the chard is wilted. Add the chick peas. Cook until all is heated through. Transfer the quinoa to a platter and top with the chard mixture. The paprika and chipotle provide just a hint of smoky heat to the recipe. If you don't like the smoke flavor, simply replace the smoked paprika with regular sweet paprika or with hot paprika if you like it hotter. Of course for those of you who really like to kick up the heat, you can always add as many drops of your favorite hot sauce as you like. This recipe is very healthy. 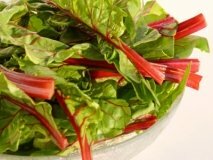 It is low in sodium and combines the fantastic health properties of the chard with other healthy ingredients like lime juice, red onion and the chickpeas. Feel free to leave out the chick peas if you don't want them. Cooking is pretty much an "add what you like, leave out what you don't" kind of thing. Season with a bit of salt if you feel the need to adjust the seasonings to your taste. We'll have more swiss chard recipes coming in our healthy recipes section. Browse now.